It’s not just about how we move people emotionally to get a message to truly land. 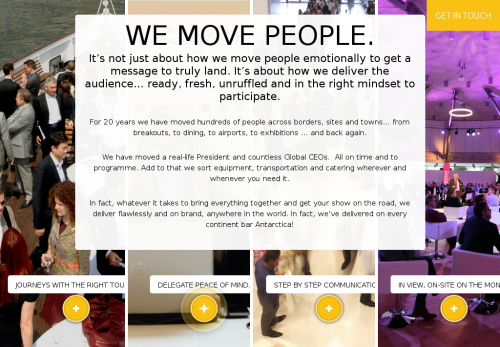 It’s about how we deliver the audience… ready, fresh, unruffled and in the right mindset to participate. For 20 years we have moved hundreds of people across borders, sites and towns… from breakouts, to dining, to airports, to exhibitions … and back again. We have moved a real-life President and countless Global CEOs. All on time and to programme. Add to that we sort equipment, transportation and catering wherever and whenever you need it. In fact, whatever it takes to bring everything together and get your show on the road, we deliver flawlessly and on brand, anywhere in the world. In fact, we’ve delivered on every continent bar Antarctica! JOURNEYS WITH THE RIGHT TOUCH. We make your event run smoothly...so event confirmation details, guided check-in, "meet and greet" and on-site baggage movement all happen seamlessly. Some of the world’s premium luxury brands trust us with their logistics worldwide. Delegates travel confident we have everything covered...signage, kit, bags, books, refreshments all sorted...so they arrive in the right mindset to engage and participate with no distractions. With the current state of heightened alert, we know who, where and how to manage safety … whether it’s for events with invited royalty or a large open bar “bash”. We have a robust contingency planning process that we work through with you, taking on board your specific protocols and working with the venues and security consultants where required. Pre-event, check-ins, during the event and in the follow up, each touch point is clear, obvious and relevant. We pre-empt the questions and worries, making the journey an event in itself. From smooth data gathering, to on-site badging, detailed itineraries to clear signage, from help desks to “on call” individuals… we can deliver in a scalable way. At every stage we are in touch, visible and available. IN VIEW, ON-SITE ON THE MONEY. In View - You will know where the Top Banana team, your delegates and your finances are at all times. You will be able to sleep easy. On-site & On the money - You want peace of mind and no surprises. So, we give you – frequent on-site updates, clear meeting schedules and clear reconciliations in a pre-agreed format. No post reconciliation nightmares.